I just finished 3 seasons of Call the Midwife on Netflix. *SIGH* I'd never ever thought I'd say I am starting to hate Netflix ... not in a bad way. Netflix can't keep up with my appetite for the good stuff (and by that I mean I want more seasons, pretty please). 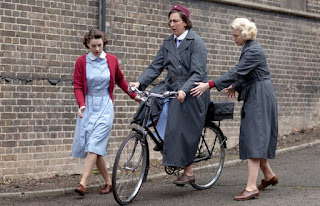 Call the Midwife is probably one the best series I've ever watched. I'd file this away with my all-time faves like Picket Fences, Six Feet Under, and Breaking Bad. The series has been around since 2012 (have I been living under a rock?!) and it now Season 5. Canada's Netflix only has Seasons 1-3. This period drama follows the day-to-day lives of a group of young women with a handful of nuns of Nonnatus House (interesting trivia: St. Raimund Nonnatus was born by Cesarean section; Nonnatus means "not born" in Latin) . These young women are a force to reckon with, serving the midwifery, and often medical needs, of the slums of Poplar district, London in the 1950s-60s. The main character is Jenny Lee, portrayed by actress Jessica Raine, the young lady in the middle of the poster). Having grown up a sheltered life, she is shocked by her own decision to work in her new profession of nursing and midwifery -- which turns out to be a life changing in so many ways. She finds a second family in her profession and becomes part of a humble yet generous community. Can I just say because? Everything about this series appeals to me: it's funny, it's heartwarming, and it's real. It's about life and life lessons. It's about poverty and making the best of it. It's about motherhood, sacrifice and love. It's about the brutality and tragedy of poverty but also about the kindness and the beauty in humanity. And it's history not only of the UK during the post-war with its difficulties and challenges but also of the tremendous advances in medicine in general. Each episode is special and memorable, typically involving the encounters of the much-esteemed midwives with a bevy of Poplar residents. An episode is a day-in-the-life of a resident. I have a number of favourite episodes (just keep reading). Of course, a highlight in each one is a birth -- complete with a twist if drama and even some humour -- and with amazing cinematography with only days-old babies! It makes watching so much affecting. I can't help but feel myself holding my breath or feeling my heart racing during the difficult deliveries (too close for comfort). And babies ... well, whose heart doesn't melt a little bit with a baby? The characters are all based on real people so it makes me feel like I have gotten to know some very worthwhile human beings in this series. Worth mentioning is my especial favourite, Chummy, who is played by Miranda Hart. What a wonderful character, immensely bighearted and just so loveable. There is a character for everyone, making the stories moreso relatable to watchers; I am sure you will find your own favourites! Tuberculosis. Birth control. Family planning. PSTD. Mental health. Medicine has grown in leaps and bounds in the past 50-80 years that it is often difficult to imagine a time when these afflictions were little understood and effective methods and treatments were only just beginning to take shape. ... of course, this is based on a book! 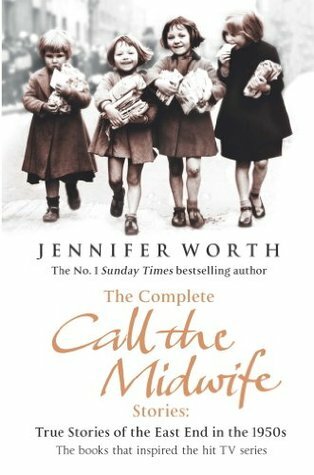 This series is based on the best-selling memoirs of Jennifer Worth also titled Call the Midwife. I have my eye on the trilogy. The series was *just*so*good* I can only imagine that reading the source material will make me better understand the difficulties folks of this era had to face. Anyway, I believe in serendipity. Over a snack, I mentioned how enamored I was with this BBC series to a colleague and we had a lovely chat. AND she has a copy of the first book -- which is now in my hands and I am raring to go! You can take a peek into this book in my recent Friday 56/Book Beginnings post. Snippets sooo good ...! Season 1, Episode 2: Introduction of new midwife Camilla Fortescue-Cholmondeley-Browne, nicknamed Chummy (because what would this series be without Chummy?). She is a huge woman with a very charming old-world way of speaking and is a natural people person, making her wards very comfortable around her. Coming from a well-to-do family, she struggles to gain Sister Evangelina's approval. As the bicycle is the fastest means of getting around the community, it is a challenge for her to learn this new skill ... but it is instrumental in her getting to know her to-be-man local policeman Peter Noakes. Season 1, Episode 3: This episode was a double whammy and sealed the deal for me - I had to keep watching this series! Jenny is assigned to help with the medical needs of Joe, an elderly former soldier who lives in a condemned tenement block destined to be torn down. She goes over and beyond her nurse duties and becomes his fast friend. Meanwhile, midwives Trixie and Cynthia deal with the inexplicable anxiety of an older pregnant woman whose husband dotes on her throughout the pregnancy. A secret is revealed during the birth, with my heartstrings tugged every which way. Christmas special (2012): The Christmas special shares the heartbreaking story of the destitute Mrs. Jenkins, a survivor of the workhouse. I had no idea of the appalling circumstances that the poor had to face in the workhouse, and the "workhouse howl" in the episode sent shivers down my spine. She keeps mistaking Jenny for her daughter Rosie whom she lost when admitted to the workhouse. Since this is a Christmas special, it also features the secret pregnancy of a teenage girl who is charged with taking care of her brothers. Fearing the ire of her parents, she delivers her child by herself and leaves the baby at Nonnatus house. The community is intent of trying to find the mother. There were many more but I urge you to watch this series yourself. Looking for an amazing and worthwhile Netflix watch? I highly recommend Call the Midwife. You will laugh and cry and experience every emotion in between. 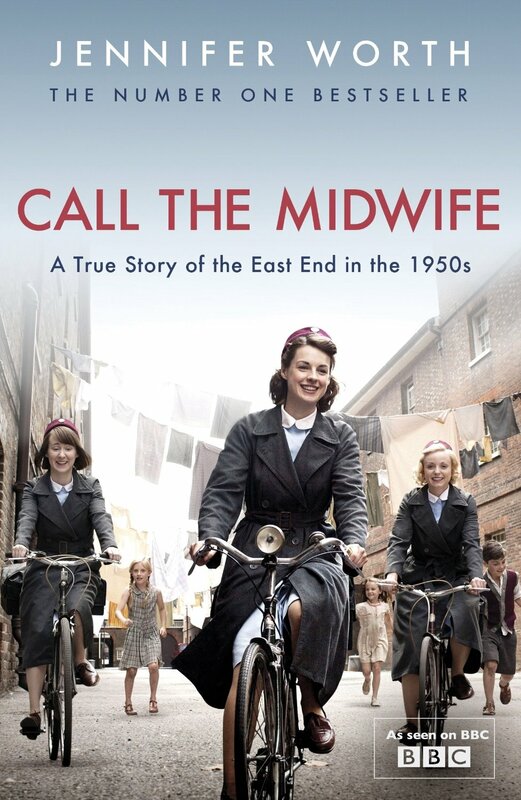 Synopsis of Call the Midwife by Jennifer Worth: London's East End in the 1950s was a tough place: the struggles of post-war life - bombsites, overcrowded tenements, crime, brothels - bred a culture of tight-knit family communities, larger-than-life characters and a lively social scene. It was into this world that Jennifer Worth entered as a trainee midwife. But docklands life was tough, and babies were often born in slum conditions. In funny, disturbing and heartbreaking stories, Jennifer Worth recounts her time among nuns, prostitutes, abortionists, bigamists, gangsters and expectant mothers, portraying East Enders' amazing resilience - and their warmth and humour in the face of hardship. Written with affection and nostalgia, her midwife stories chronicle the lives, traditions and tales of a bygone era.